The national nonpartisan Economic Policy Institute ranks Indiana 39th among states for income inequality. 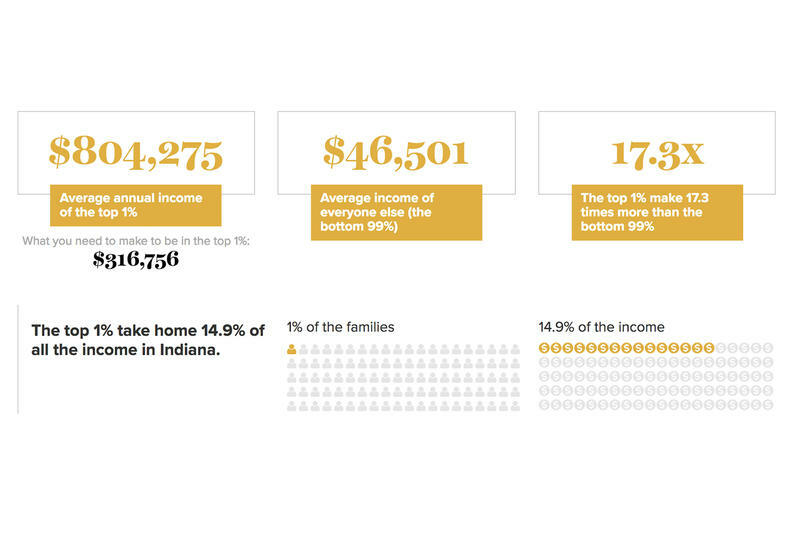 The institute reports the average top 1 percent in Indiana earns 17.3 times more than the average income of the rest of the state. “What’s really significant about that is that it reflects not just a disparity between what the average Hoosier household is taking home, but it is also reflecting policy changes that’s widening that gap,” says Indiana Institute for Working Families senior policy analyst Andrew Bradley. Income inequality in Indiana has been on the rise since the post-war years. Between 1945 and 1973, the top one percent captured under 6 percent of economic growth. But in the next 42 years, the top 1 percent collected 72 percent of income growth. Bradley says the publication shows a trend in all areas of the state. The most unequal distribution of wealth is in the metro area of Warsaw, where the top 1 percent average 27.3 times more than the bottom 99 percent. The study also found the most unequal county in the state is Dubois County, with the top one percent make 30.2 times more than the bottom 99 percent. Bradley says it’s too early to tell how the Trump administration’s recent tariffs could impact income inequality. But economic factors like that could make an impact. “I do think that there is something to be said that instability on top of stagnant wages isn’t going to help the average working family,” he says. Bradley sees the report as a wakeup call. He says income inequality can be reversed through tax law and raising the minimum wage. And he criticized the Right to Work law. Bradley says the Indiana Institute for Working Families is working on a report that compares Indiana with neighboring states on issues including wages, poverty and unemployment. It is slated for publication Labor Day weekend.